If you’ve ever wondered what the phrase “well-rounded individual” means, take one look at Joseph Rizzo. 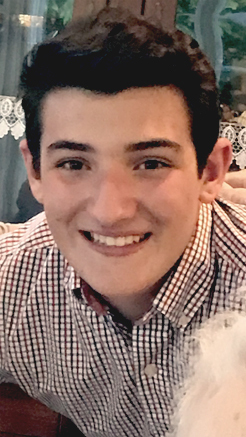 He loves golf, swimming and the outdoors; plays three musical instruments; is studying Latin and Spanish, and loves math and science in school; is working toward becoming an Eagle Scout; and wants to be neurosurgeon and help people. Not too bad for a teenager. You attend Christian Brothers Academy in Syracuse. Some of us don’t know much about it. What’s the school like and what do enjoy most about it? Christian Brothers Academy is a Catholic LaSallian college preparatory school. We have a strict dress code and we start every class with a prayer. Every class has a cross on the door. Everyone is always cheerful, kind and genuine. The friends and teachers that I have are wonderful. I am grateful for my learning environment at CBA. Your favorite subjects are math and science, something many students cringe about. Why do you like them so much? I like math and science because the two subjects come easier to me than many other subjects. I can’t explain it, but the two subjects have always interested me. I guess that’s the way God made me. Do you envision a future career using those skills you learn in those classes? Yes. I envision myself becoming a neurosurgeon. I want to help people, and I have had a calling for the medical field since I was 5 or 6. You also are studying Latin and Spanish. Many people speak Spanish, but why Latin? Many languages originated from Latin, and it is actually a required language in high school at CBA. Latin helps me to understand the base concept of English words. You’re on the varsity golf and swim teams. What do you like about each sport and what do you learn from them? I have made so many great friends from each sport, and I find both sports relaxing and a great way to unwind after a long day at school. I have learned to always do my best whether I know I am going to win or if I am going to lose. Music also is a passion of yours. You play violin, trumpet and piano. Those are a diverse set of instruments. How did you get interested in all three, and do you have a favorite? I do not have a favorite out of the three instruments. I started playing piano because my parents encouraged me to start taking lessons. My uncle plays the violin, and when the sign-up sheets for orchestra came around the classroom in fourth grade, I thought that it might be fun to try. In fifth grade, the sign-ups for brass instruments were passed around the classroom, and my father played the trumpet when he was younger, so I decided to put my name down for the trumpet. I have been playing all three and participating in school band and orchestra ever since then. Hiking, water sports, downhill skiing and camping. You enjoy them all. Why do you like the outdoors so much and how did you get interested in those activities? My parents introduced me to all of these outdoor activities. Every summer, we go camping together as a family, and I enjoy many outdoor activities with my parents and friends. You’re a Scout. What has Scouting taught you? Right now, I am a Life Scout and I am working toward Eagle, which is the next rank of advancement. I will have completed my Eagle rank by the end of June 2019. Scouting has taught me to help others and to always be courteous and kind to everyone I meet. In our parish, you’ve been an altar server for a few years and now you also help train new servers. Why did you become a server and what do you like best about it? I became an altar server because I wanted to help out the church. I feel closer to God when I am on the altar and I love serving at Mass. What does Mount Carmel / Blessed Sacrament mean to you? Mount Carmel is the community I grew up with. I was baptized at Mount Carmel and I am making my Confirmation at Mount Carmel as well. It means a lot to me to be a part of this church community. How do you think faith works in your life? My Catholic faith is part of my everyday life. My faith keeps me healthy and happy, and I incorporate it into my school day and in my free time. My grandmother always tells me to do one good deed every day. I firmly believe that it is important to give back to my community and help others. I hope my future holds the same blessings that my present holds for me now. I hope to get into a good college and have a career that allows me to help others every day. School: 10th grade at Christian Brothers Academy in Syracuse. Things you like to do in your spare time: Ski, play golf and hike.